The IHRA Summit SuperSeries, the largest and most prestigious bracket racing program in drag racing, will return for an 18th consecutive year in 2019. The $200,000 program is the World Championship for over 8,000 IHRA member-track racers each season and held at nearly 100 IHRA-sanctioned member tracks. In 2018, IHRA Summit SuperSeries track champions from 28 states and international competitors from Canada, and Aruba were represented in Top (Box), Mod (No Box) and Junior divisions along with Summit Team Final champions from six IHRA regions competing at the IHRA Summit SuperSeries World Finals at Memphis International Raceway. 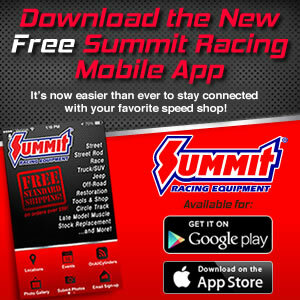 For more information about Summit Racing Equipment visit summitracing.com.